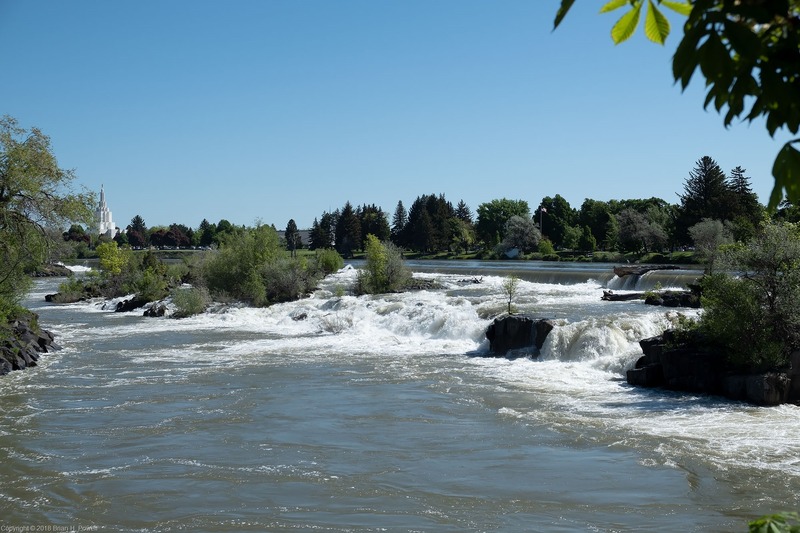 I got up early on Friday to drive the three hours from Canyon Village in Yellowstone, through West Yellowstone, and then down to Idaho Falls. Why? Because of some upcoming international travel, I needed a Yellow Fever immunization. Due to timing, and a nationwide shortage of said vaccines, it was most convenient for me to make an appointment with Eastern Idaho Public Health. I arrived early (as planned, just in case), so I went down to see the eponymous falls. A Mormon Temple is in the background on the left. 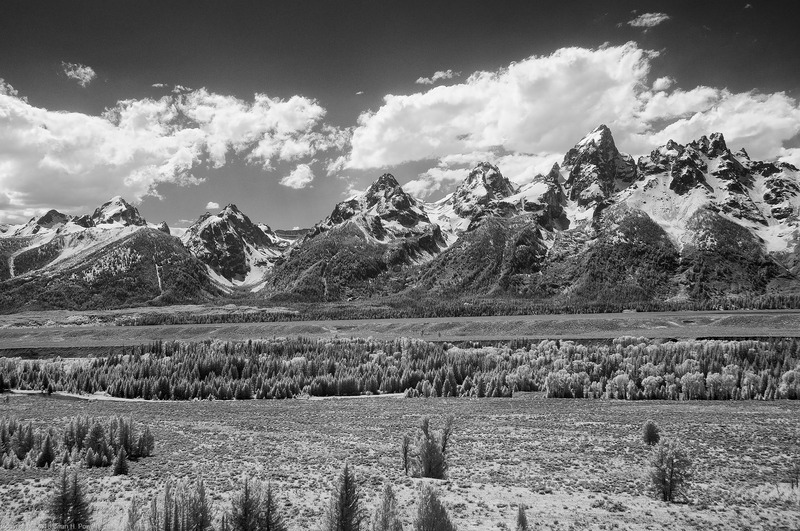 After my immunization, I had lunch, and headed eastward to go over Teton Pass. 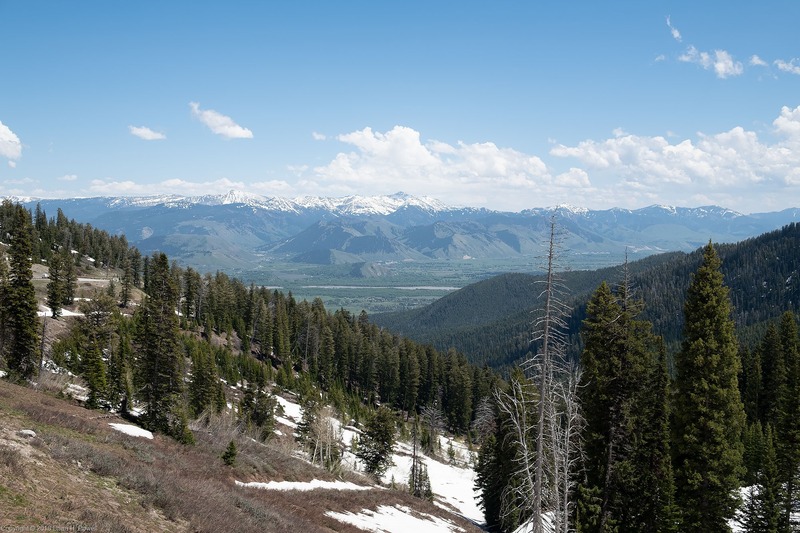 From the top, you can see a nice view of Jackson Hole. I drove on down to Jackson and got settled into the Jackson Lake Lodge in Grand Teton National Park for my final night. I did a little infrared photography in the bright afternoon sun, before heading back to Jackson to meet with a couple of friends for one final night. 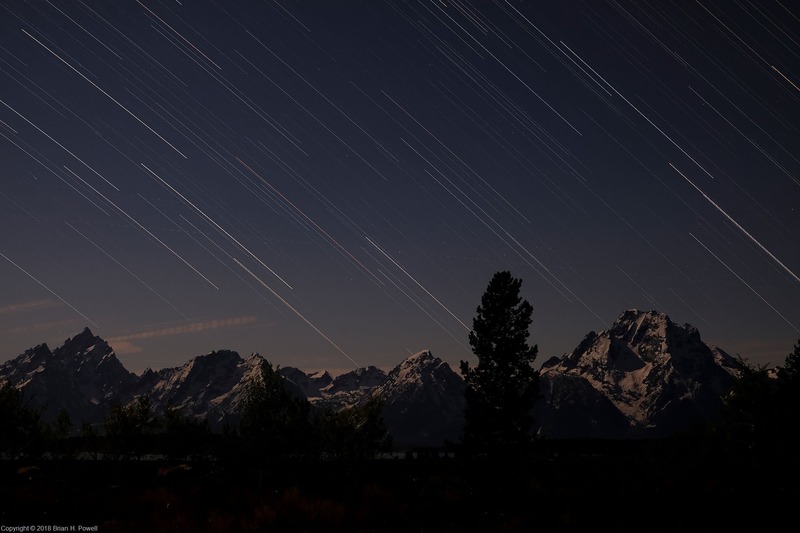 Because of the great location and view from near my hotel room, I set up my camera for star trails. I did a couple of 35-minute captures from about 11 PM to a little after midnight.. Here’s one of the photos. The moon was waxing gibbous, and provided plenty of illumination for the snow on the mountains. Despite the late night, I rose early in hopes of great color at sunrise. I got a little bit of pink in the sky, much like earlier in the week. 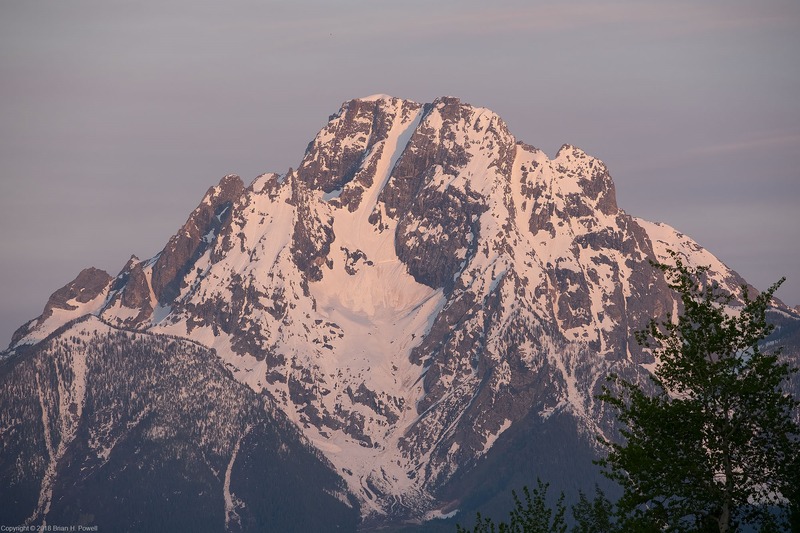 Here are a couple of photos—one of Mount Moran, and one of Mount St. John. Before I knew it, it was time to leave for the airport and fly home. A big thank you to my friend Charlotte for sharing wine, cheese, and a hyperactive dog in her beautiful home, and for including me in her network of friends, who all made me feel welcome a long way from home. 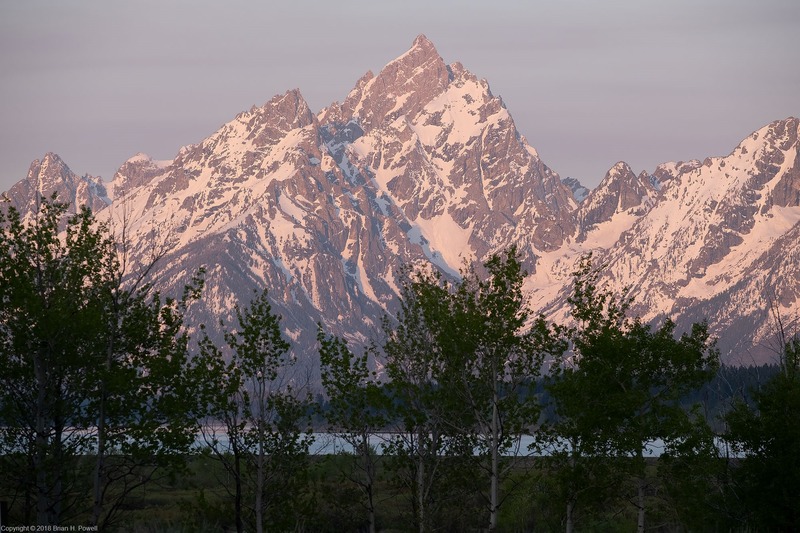 I am grateful for the beautiful places like the Grand Tetons and Yellowstone, and all the other National Parks and National Monuments we are blessed to protect for future generations.